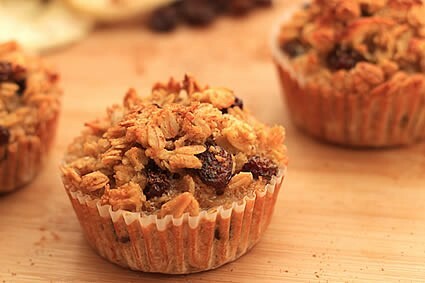 An apple, raisin and cinnamon flavoured oat muffin that tastes like baked oats porridge. In a separate bowl whisk together the milk, coconut oil and egg. Add the bowl of wet ingredients to the dry ingredients. Pour in the honey, molasses and add the grated apple and mix all the ingredients together. Your mixture will be quite wet. If you have added coconut flour, leave the mixture to stand for 5 minutes for the coconut flour to thicken. Line your muffin tray with muffin wrappers and carefully spoon your mixture into the muffin cups. Bake for 40 minutes at 180?C or until the top of the muffins start to brown and the oats have a warm toasty look about them. Allow to cool before removing the muffins from the muffin tray. These muffins are best served warm. You can store them overnight in the fridge in a sealed container. Reheat them the next day in the microwave before eating.